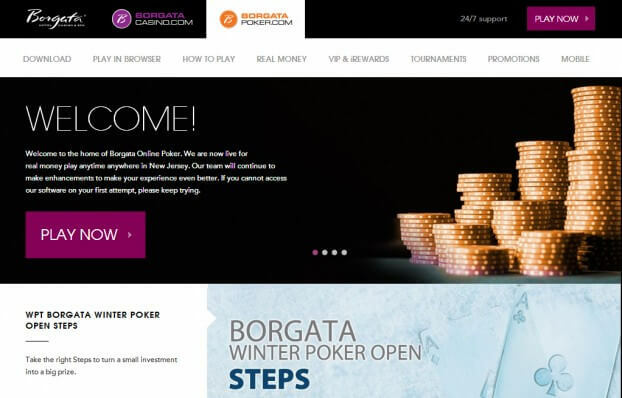 The Borgata Hotel Casino & Spa which operates its online poker site at https://poker.theborgata.com/ offers one of the better visual website that you will find for an online poker site. The website is responsive so it looks good on almost any mobile device and it also allows you to easily navigate to find what you are looking for. The software provider behind the website and the actual gaming software is bwin.party which also operates http://nj.partypoker.com/. The two sites are the founders of the Party/Borgata Poker Network which currently holds a 50% market share in New Jersey. I wanted to put together this article to point out a few issues I am currently seeing when I attempted to navigate around Borgata’s site. When you click on Affiliates which is located on the footer it actually takes you to a whole other site which is found at http://www.borgatapartners.com/. When that new site loads you are hit with a domain parking page with a very small “Coming Soon” on the top right of the page. It would seem on the surface that they have plans to add an affiliate program but they have not gotten around to actually developing the website or even putting up a place holder stating that. It is very standard for a company to put up a simple landing page stating the website is coming soon and even in most cases have a contact form so a potential affiliate can be notified when the site is actually ready to go. Another issue I have experienced is when I clicked on Responsible Gaming on the footer it brought me to https://poker.theborgata.com/responsible-gaming.html which then gave me the option to click on a sub navigation on the left. All of those left links go to the same exact page. These issues are all minor and most likely out of the control of the Borgata and a direct result of bwin.party dropping the ball. The website overall does what it is designed to do which is to allow players the ability to access the real money poker tables. You definitely can tell that bwin.party is putting its best efforts behind its own brand as their website is flawless and does not have these issues.